Sharon Christa McAuliffe (September 2, 1948 – January 28, 1986) was an American teacher from Concord, New Hampshire, and was one of the seven crew members killed in the Space Shuttle Challenger disaster. She received her bachelor's degree in education and history from Framingham State College in 1970, and also a master's in education supervision and administration from Bowie State University in 1978. She took a teaching position as a social studies teacher at Concord High School in New Hampshire in 1983. In 1985, she was selected from more than 11,000 applicants to participate in the NASA Teacher in Space Project and was scheduled to become the first teacher in space. As a member of mission STS-51-L, she was planning to conduct experiments and teach two lessons from Space Shuttle Challenger. On January 28, 1986, the shuttle broke apart 73 seconds after launch. After her death, schools and scholarships were named in her honor, and in 2004 she was posthumously awarded the Congressional Space Medal of Honor. In 1984, President Ronald Reagan announced the Teacher in Space Project, and McAuliffe learned about NASA's efforts to find the first civilian, an educator, to fly into space. NASA wanted to find an "ordinary person," a gifted teacher who could communicate with students while in orbit. McAuliffe became one of more than 11,000 applicants. "I cannot join the space program and restart my life as an astronaut, but this opportunity to connect my abilities as an educator with my interests in history and space is a unique opportunity to fulfill my early fantasies." 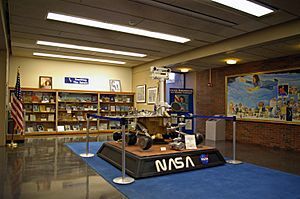 The Council of Chief State School Officers, a non-profit organization of public officials in education, was chosen by NASA to coordinate the selection process. Out of the initial applicant pool, 114 semi-finalists were nominated by state, territorial, and agency review panels. McAuliffe was one of two teachers nominated by the state of New Hampshire. The semi-finalists gathered in Washington, DC, from June 22–27, 1985, for a conference on space education and to meet with the National Review Panel that would select the 10 finalists. On July 1, 1985, she was announced as one of the 10 finalists, and on July 7 she traveled to Johnson Space Center for a week of thorough medical examinations and briefings about space flight. The finalists were interviewed by an evaluation committee composed of senior NASA officials, and the committee made recommendations to NASA Administrator James M. Beggs for the primary and backup candidates for the Teacher in Space Project. On July 19, 1985, Vice President George H. W. Bush announced that she had been selected for the position. Another teacher, Barbara Morgan, served as her backup. According to Mark Travis of the Concord Monitor, it was her manner that set her apart from the other candidates. NASA official Alan Ladwig said "she had an infectious enthusiasm", and NASA psychiatrist Terrence McGuire told New Woman magazine that "she was the most broad-based, best-balanced person of the 10." 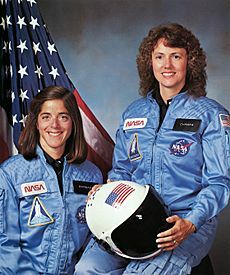 Later that year, she and Morgan each took a year-long leave of absence from teaching in order to train for a space shuttle mission in early 1986. (NASA paid both their salaries.) While not a member of the NASA Astronaut Corps, McAuliffe was to be part of the STS-51-L crew, and would conduct experiments and teach lessons from space. Her planned duties included basic science experiments in the fields of chromatography, hydroponics, magnetism, and Newton's laws. She was also planning to conduct two 15-minute classes from space, including a tour of the spacecraft, called "The Ultimate Field Trip", and a lesson about the benefits of space travel, called "Where We've Been, Where We're Going, Why." The lessons were to be broadcast to millions of schoolchildren via closed-circuit TV. To record her thoughts, McAuliffe intended to keep a personal journal like a "woman on the Conestoga wagons pioneering the West." After being chosen to be the first teacher in space, she was a guest on several television programs, including Good Morning America; the CBS Morning News; the Today Show; and The Tonight Show Starring Johnny Carson, where, when asked about the mission, she stated, "If you're offered a seat on a rocket ship, don't ask what seat. Just get on." She had an immediate rapport with the media, and the Teacher in Space Project received popular attention as a result. On January 28, 1986, McAuliffe boarded Challenger with the other six crew members of STS-51-L. Just 73 seconds into its flight at an altitude of 48,000 feet, the shuttle broke apart, resulting in the deaths of all seven crew members. The Presidential Commission on the Space Shuttle Challenger Accident—also known as the Rogers Commission—was formed to investigate the disaster. It determined that the accident was due to a failure of rubber O-rings made by Morton-Thiokol that provided a pressure seal in the aft field joint of the shuttle's right Solid Rocket Booster. The failure of the O-rings was attributed to a design flaw, as their performance could be too easily compromised by factors that included the low temperature on the day of launch. The Commission found that O-ring resiliency is directly related to temperature and due to the low temperature at launch—36 degrees Fahrenheit or 15 degrees lower than the next coldest previous launch—it was probable the O-rings had not provided a proper seal. McAuliffe was buried at Blossom Hill Cemetery in her hometown, Concord. She has since been honored at many events, including the Daytona 500 NASCAR race in 1986. 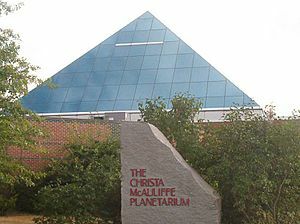 The McAuliffe-Shepard Discovery Center in Concord and the Christa Corrigan McAuliffe Center for Education and Teaching Excellence at Framingham State University are named in her memory, as are the asteroid 3352 McAuliffe, the crater McAuliffe on the Moon, and a crater on the planet Venus, which was named McAuliffe by the Soviet Union. 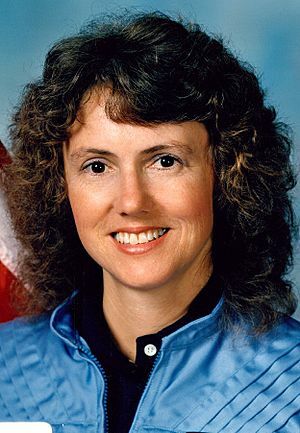 Approximately 40 schools around the world have been named after her, including the Christa McAuliffe Space Education Center in Pleasant Grove, Utah. Scholarships and other events have also been established in her memory. The Christa McAuliffe Technology Conference has been held in Nashua, New Hampshire, every year since 1986, and is devoted to the use of technology in all aspects of education. The Nebraska McAuliffe Prize honors a Nebraska teacher each year for courage and excellence in education. Grants in her name, honoring innovative teachers, are provided by the American Association of State Colleges and Universities and the National Council for the Social Studies. In 1990, she was portrayed by Karen Allen in the TV movie Challenger. The spaceship on the 1996–1997 children's science-fiction series Space Cases, about a group of students lost in space, was called "Christa". In 2006, a documentary film about her and Morgan called Christa McAuliffe: Reach for the Stars aired on CNN in the CNN Presents format. The film, produced by Renee Sotile and Mary Jo Godges, commemorated the 20th anniversary of her death. It was narrated by Susan Sarandon, and included an original song by Carly Simon. Christa McAuliffe Facts for Kids. Kiddle Encyclopedia.